That’s funny, I thought the wing was on the boidies. Yes, spring has arrived in this Southern Hemisphere, slipping in and out admidst torrential rain and coolish days. Teasing us, then leaving us. With the tantalising promise that summer, in all it’s glory will soon be here. 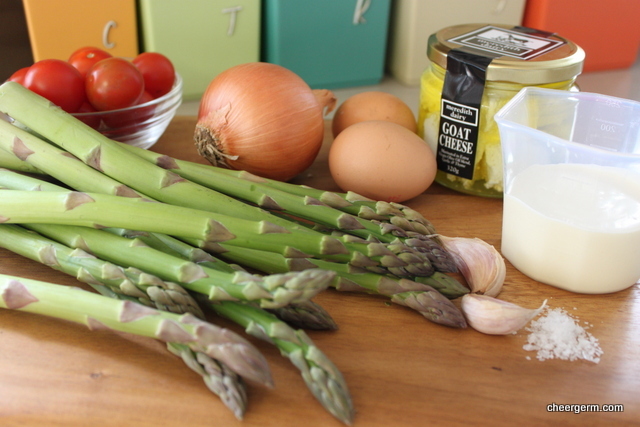 Nothing says spring like an asparagus spear or two. Back in the good old gluten laden days, the Yak and I devoured many an asparagus tart made with puff pastry. Now the GF dust has settled, I am once again venturing into the whimsical world of pastry. GF styling it baby. 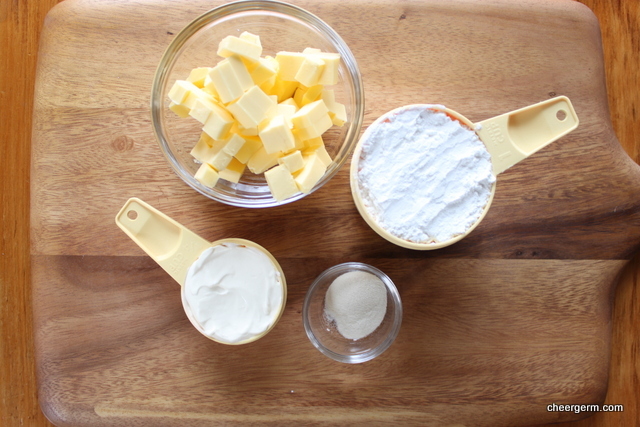 Thanks to the lovely ‘gf and me’ blog for their sour cream pastry recipe. I have provided a link to their original recipe below. This is purely a replica of theirs but I needed to add a dash of iced water, probably due to the difference in gluten free flour blends used. The sour cream in this pastry is banging. Having used it in my non GF pastry blends, it’s great to see it working here. The pastry was light and crispy and The Yak has given this tart the big coeliac thumbs up. He is annoyingly endearingly asking me to make it again soon. 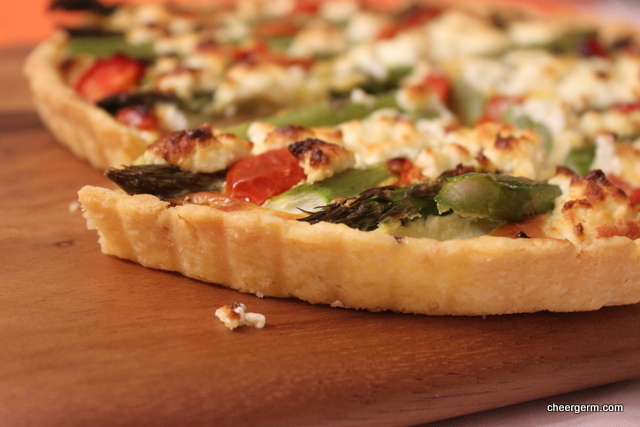 Of course, you can use this filling in any regular gluten laden crust you desire. This Meredith goats cheese was on special the other day and a free cheese cookbook was thrown in. Bonus! I have been loving on this cheese for quite a few years now. (It’s not illegal to love on a cheese, surely?) The experience of tasting this wee beauty at a farmers market years ago was surprising. It wasn’t all My Highland Goaty Oaty Oaty in your face but sweet, mellow and delicious. This cheese is awash in golden fruity extra virgin olive oil with the herbaceous notes of thyme and garlic. Great in tarts, frittatas, fabulous tossed into a salad, thrown into a fritter batter or shmeared on a cracker or slice of fresh bread. 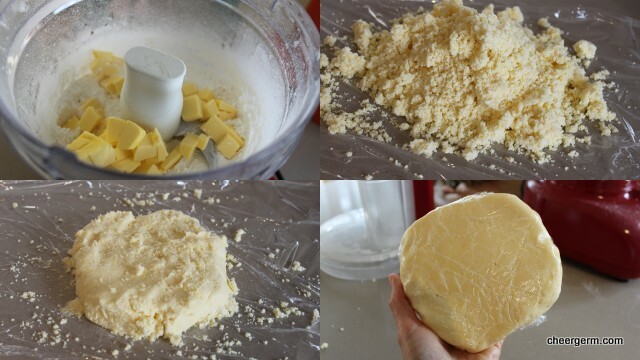 Put flour, xanthum gum and salt into a food processor and pulse to combine. Add the butter and pulse until the mixture comes together and forms pea sized balls. Add the sour cream and pulse until the dough starts to hold together. You may or may not need to add the chilled water. I did. Roll into a ball, cover with plastic and let rest in the refrigerator for at least 4 hours. Preheat oven to 200C. Remove dough from fridge, let it sit for 10 minutes then place between two floured pieces of baking paper and roll out to the correct size to fit your tin. 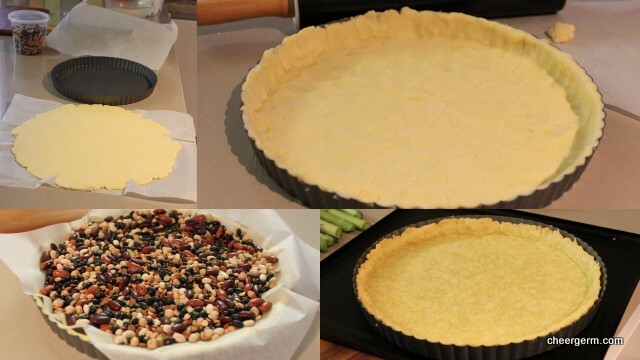 I used a 24cm loose bottom fluted tart tin. A rectangular one would be great. (I have misplaced mine.) Gluten free pastry can be very soft, don’t be surprised if you need to patch a few places. Remove tart shell from oven, take out the baking beans then put back in the oven for another ten minutes. The tart shell is then ready to fill. 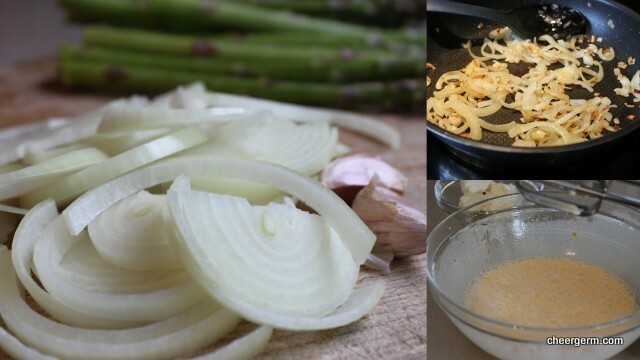 Sauté onions until soft for about ten minutes. Beat eggs and cream, season with pepper and a wee bit of salt. Place onions on bottom of blind baked tart and pour the egg and cream mixture over the onions gently. 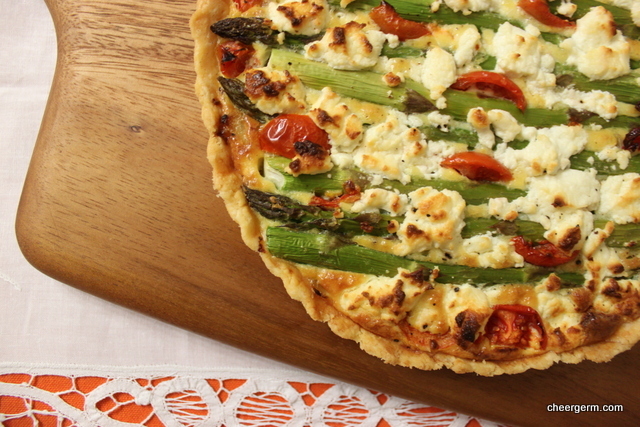 Place the asparagus and tomatoes in an artistic (not so in my case) fashion. I did find it hard to squeeze the tomatoes in. Bake 20-30 minutes at 190C until egg is set and puffy and golden. Serve with a salad, steamed green beans or whatever you fancy. Just to note, there is no affiliation with Meredith Dairy, I just love their cheese. 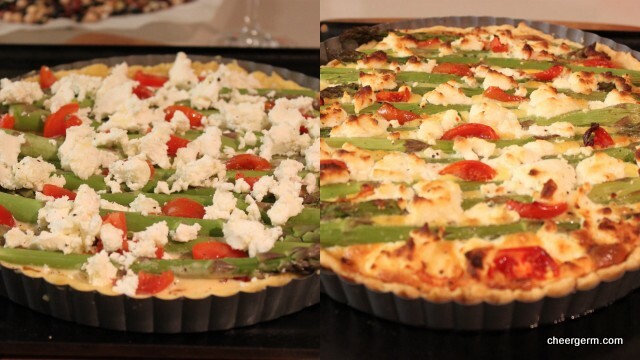 This entry was posted in Gluten free main courses, Vegetarian and tagged asparagus, baking, cheergerm, food, gluten free, gluten free asparagus and goats cheese tart, gluten free tart, goats cheese, Meredith goats cheese, recipes, Vegetarian. Bookmark the permalink. I love Meredith diary’s cheese too! The pastry looks like the real McCoy, I’m going to give it a whirl. Thanks for sharing! It’s a really lovely cheese hey? I was really impressed with this pastry, being GF and all. The xanthum gum is a bit weird when you are working with the pastry (in the initial phases of patting it together to refrigerate, ie, you know the slightly slippery quality it gets?) but once it’s rested and you roll it out, it is totally fine and does it’s work keeping it all together. The pastry had a really authentic bite and quality. Would love to hear how it goes for you. Pastry looks amazing. Don’t get Meredith cheese here in the UK, but it looks like a good quality feta might be a good substitute. Great combo of veggies! Thanks, was the best GF pastry I have made so far! Thanks to ‘gf and me of’ course! I think a good quality feta would be beautiful with a healthy dribble of EVO! 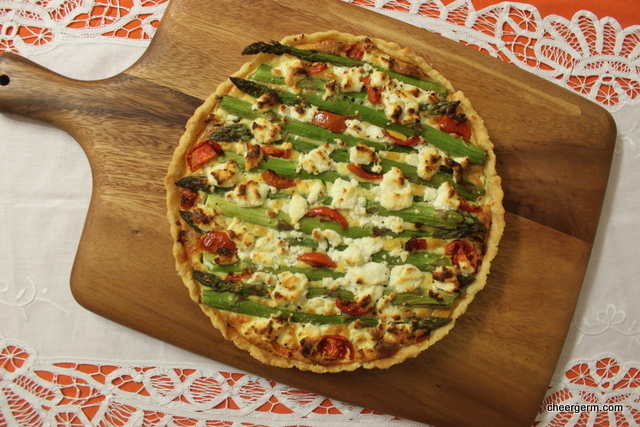 Good old asparagus and tomatoes hey? Another snap on recipe ingredients this week! I couldn’t resist squares of Meredith’s for dinner, yours is far more elegant than mine though – looks absolutely delicious. And we finally had a lovely spring day in Melbourne today, I’m looking forward to complaining about it being too hot soon! It’s a gorgeous combo. 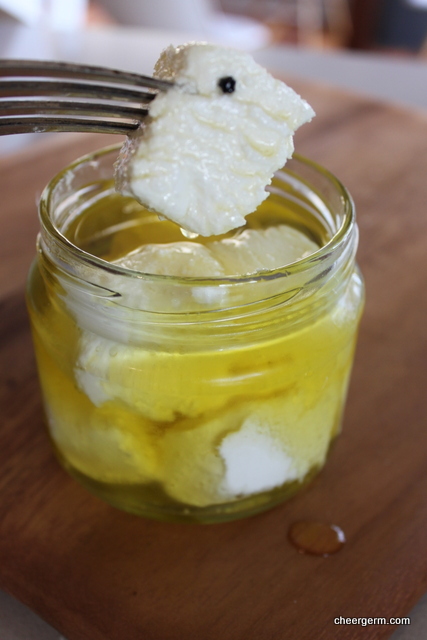 I have used marinated feta before which is also fab but I think some goats cheese chunks that have had a wee rest in good EVO, garlic cloves and fresh thyme would be the business! Moments like this that I just wanna say F*ck it. I’m eating cheese. I’ll deal with the genocide my intestines will go through later. I do believe you have just written down the recipe for paradise in a pie. These ingredients, embraced by a flaky crust are as close to a peak over the pearly gates as one can hope for in this lifetime. You just feel better looking at it. And eating this would be nirvana. I may just take a quick shortcut tonight and use one of my GF freezer crusts. I have to start testing out those pie crusts before our American Thanksgiving rolls round. But I will surely be giving thanks and sending it southbound tonight after dinner for such a fabulous recipe. The love between man (or woman) and cheese is a glorious thing. Embrace it, my friend! Jennee is gonna love this tart! Hope she does! A love sonnet of cheese should be written, what was Shakespeare thinking? Your tart looks and sounds fabulous. Glad you enjoyed the pastry recipe! Oh wow, I have never seen a GF pastry that looks so even and gorgeous. I am definitely popping this onto my ‘to bake’ list. Thankyou! Hope you enjoy it! I did roll it quite thin to fit my tart tin but it held together well. Thanks again to gf and me for the pastry recipe. It made my coeliac hubby a very happy man. The goats cheese and asparagus were fantastic together. OMG. How delicious does this look? This is going on my list of ones to try. Possibly today! It was a really tasty tart. Loving seeing some spring veg around finally in this part of the world. Hope you get to it, if not today, some other day!